A PENDULUM IS A WEIGHT ON A STRING, THAT'S ALL. YOU CAN EVEN USE A BUTTON ON A STRING. It is not the Pendulum that gives the answers. It comes from you. Use a pendulum as your point of focus. 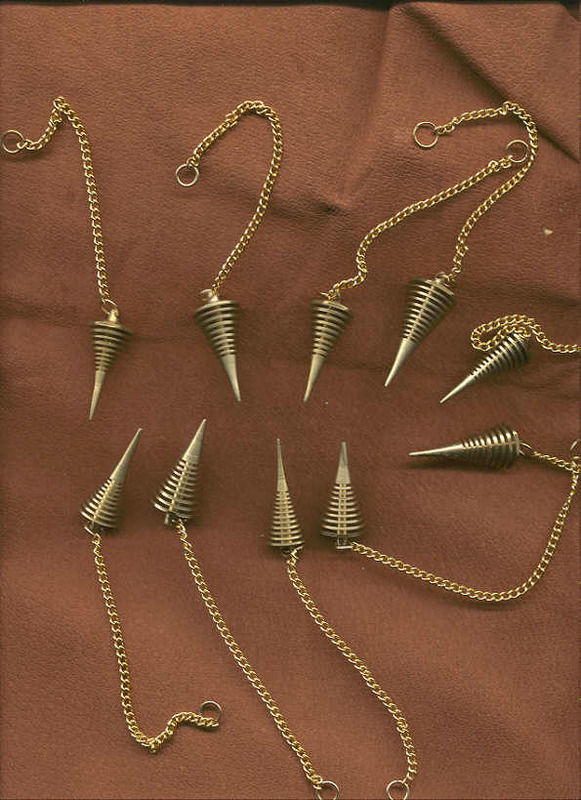 Our friend Joey Korn sells these pendulums. after all its his favorite pendulum! Joey is also a great teacher and a friend of the Toronto Dowsers. Check out the wisdom and neat stuff on his site. What is so special about the JOE SMITH DANCING pendulums? We like the weight, we like the balance, their responsiveness. Perhaps there is something else, an ineffable quality that lends more importance to its success: these pendulums are hand made by a moral man of good down to earth values, he is now one of our wise elders and a man of basic honest convictions that he has been living with and by for a long and good life, a man balanced by his peer in his wife, Marta. What do you think he puts in to these tools that make them so special? Intent. Joe Smith is a farmer from Johnson, Nebraska. A septuagenarian, Joe is one of the favorite and best known dowsers in North America. A favorite, because in addition to his wisdom he is liked and respected as both an excellent dowser and human being. He is a trustee of the American Society of Dowsers and gives presentations to dowsing groups on basic dowsing, dowsing for farmers, etc. In another setting he would be snapped up and made famous as an icon of dry farmer's wit and [un]common good sense. Joe keeps our bombast in line with just a few well placed words. He's also a good [i.e., successful] oil dowser. No fool, our "old Joe". Joe says: "These pendulums work well because mainly it is the balance of the weight and the fact that they have so much surface area to pick up signals with. They are designed like a series of radar dishes, stacked one on top of another, to receive all in-coming signals. They will send out as well as receive much more than the normal pendulum." Joe makes each brass pendulum individually on a lathe in his shop, one at a time. No two are identical. They pick up so much energy from the Universe that they seem to vibrate or "dance". Hence the name "Joe's dancing pendulums". I have a small supply of the pendulums that are for sale, pendulums that I purchased from Joe before his August 2010 passing.